------ What the Narc’s (to this day) DON’T WANT you to know about him. Many books have been written about President Franklin Roosevelt (who guided or misguided) America during the worst of the great depression of the 1930’s. And while ALL of them go over his economic polices in great detail, most ignore the simple yet important fact that Roosevelt, the man, had polio and was wheel chair bound. --- It appears that few thought it an important enough factor to give it more than token lip service. Yet, as this author sees it, a factor that would effect ANYONE’S everyday thoughts and actions. One that simply could not be ignored. Here in this chapter . . . Before going any further into the actual (as well as the very fictitious) evidence against Victor Licata. This author feels that it would be best to first go over a few little (yet) important factors about Victor Licata's state of physical health. Facts that are not widely known and even most important of all, facts that the narc’s surely (to this day) don’t want you to know. 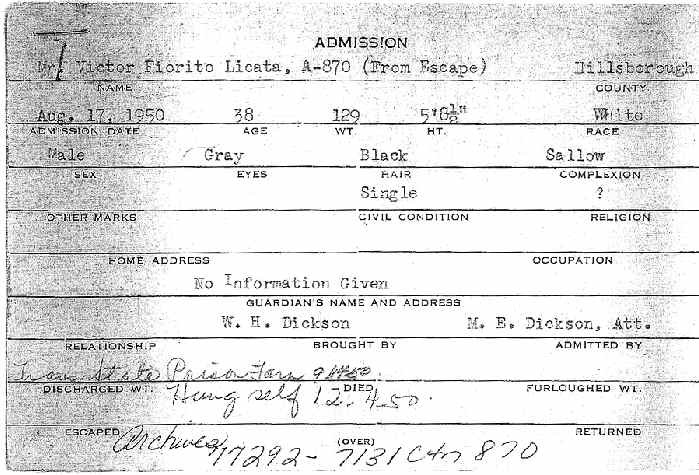 Although most of Victor’s medical records from the Florida State Hospital in Chattahoochee have (mysteriously) long ago gone missing. 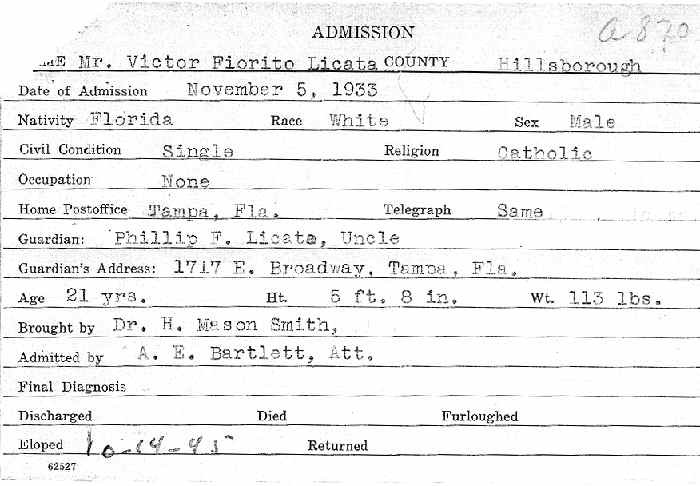 According to his 1933 “Admission Record (Index Card) Victor Licata ONLY WEIGHED 113 pounds. HERE WE REPEAT OURSELVES --- Victor Licata only weighed 113 pounds. In fact according to his 1950’s (ah, Re-Admission Record) Index Card (see below), it seems he never weighed more than 129 pounds. 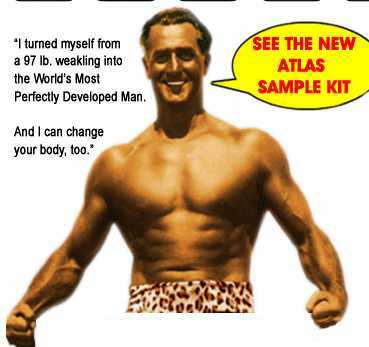 In other words, everyone agrees that Victor Licata was no Charles Atlas; --OR WAS HE? 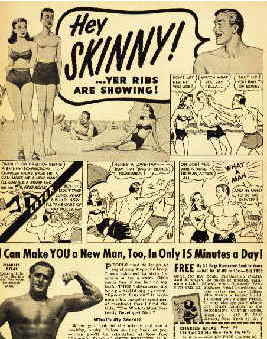 As we will soon see, some of Victor’s (alleged) actions would have required some one with Charles Atlas like supper human strength! Here in this section we look at some of the super human feats that Victor Licata was alleged to have committed. Feats easily rivaling those of Charles Atlas any-day. Reminding the reader that this is the year 1933 and thus we are NOT talking about an aluminum anything, but one of those heavy raw iron things. 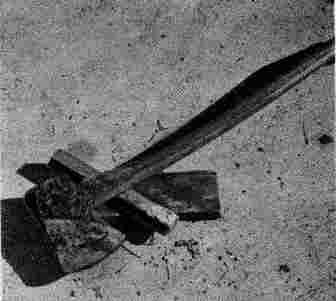 One wonders how a 113 pounder (in poor physical condition), could have even lifted the five to seven pound axe, let alone wielded it in the manner needed for the task? However, the author has been told by numerous out-doorsie types that it is indeed possible. It seems the main physical ingredient needed to wheel an axe is height. One assumes that this has something to do with the physics of gravity behind an axe swing that allows almost anyone to wield it about. However, it is still a factor (combined with several others), that the reader must constantly take into account as we look over the rest of the evidence. 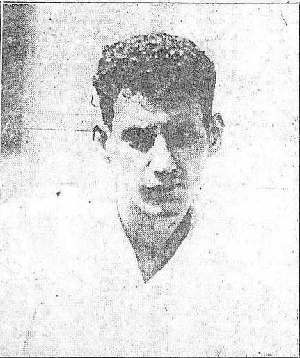 According to the newspaper articles at the time, (by implication) Victor Licata (somehow) while keeping and lifting and hacking away with an axe in one hand, somehow also found a way to move Mike Licata’s bed outward and pin him physically between the bed and the wall. Hummm! Remembering that the year is 1933 ; Here we are dealing with a rod-iron bed – meaning heavy as hell. Our best estimates are that it weighted 50 to 60 pounds easily, but probably a hell of a lot more. MUSEUM NOTE: The author found one of these golden beauties in an antique store. Couldn’t even budge it. --- By my calculations, it would take at least 2 but probably 3 strong individuals to physically pick up and move a bed like that around. AND this is not taking into account the fact that Mike Licata was allegedly ON THE Bed at the time. 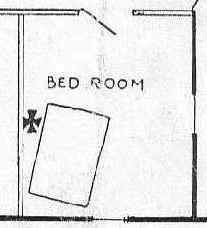 A BED’S FOCUS OF BALANCE When one picks up a bed by one of the corners, due to the fact that a bed has four posts, most of the weight is said to shift to the remaining three corners. Thus . . . at least in theory, it is possible for one to lift one edge of a bed and slide it around without too much effort. This could explain how a 113 pounder like Victor could have (while holding an axe in one hand, and trying to pin his father with the other), moved the bed, or does it? This focus of balance, that a bed is supposed to have, ONLY seems to take place if the bed is in rock solid condition. Example if the bed bends too much or acts like a piece of rubber, this effect is totally negated. And these old rod-iron beds, by definition, don’t seem to stay rock solid for very long. At least not the ones I’ve seen in old antique stores. 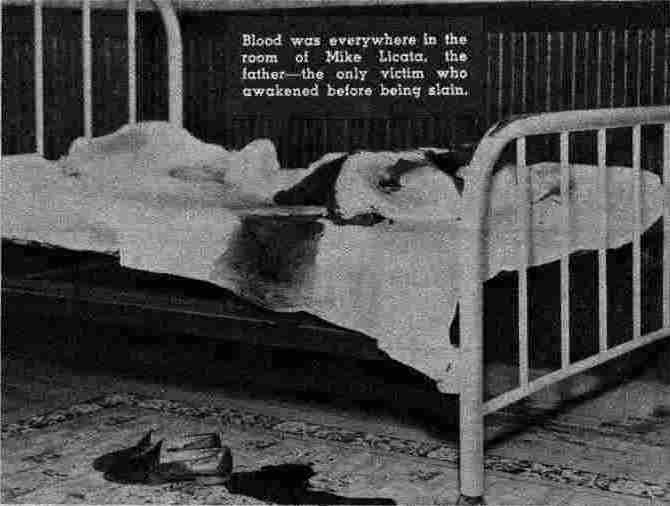 A look (even a black and white) crime scene photo of the bed clearly shows that that bed had been around for a while. The author (who clearly weighs more than 113 pounds), has personally attempted to lift up some of these old rod-iron beds by the corners ---- with little success. These things just bend like rubber bends, thus negating the focus or centering of balance affect. Somewhere along the line it seems that the narc’s must have figured out that Victors physical stature might be a problem with their anti-Medical Marihuana story. The kid just wasn’t big enough to have done what he was supposed to have done, period. But no problem, the narc’s (back then as now) have always been big on lies, so what was yet one more to them. 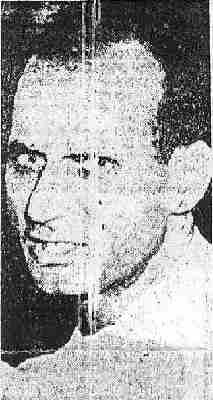 Excluding his mug shot, The following is probably the most famous picture ever taken of Victor Licata. 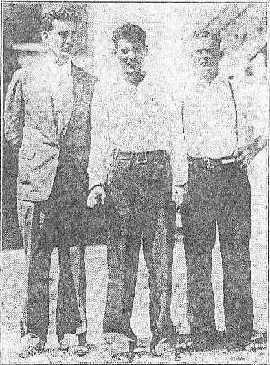 Originally snapped on the day of the murders (Oct 17, 1933) by a Tampa Times reporter at the county jail, where Victor was being held. Unfortunately, most people have never actually seen the full photograph (shown on the left); -- Only the cropped or edited version (shown on the right), which creates the illusion that the 113 pound Victor Licata was much taller, bigger and meaner then he actually was. 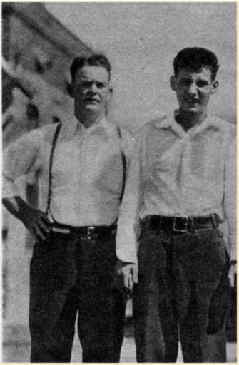 Got to hand it to them however, --- Even back in the 30’s the narcotics police were taking full advantage of whatever technology they had at hand in their war against Medical Cannabis patients. Note that this photograph (published in the Tampa Times newspaper on the very day of the murders) clearly contradicts Chief Detective W.D. Bushes version of the story (see Chapter 10) that Victor was first taken to a hospital and only after Victor became uncontrollable, was then taken to the county jail by the Sheriffs Department. Of photographing badly, Victor was guilty as sin. One wonders what would have become of Victor Licata today. In an age of facebook, myspace etc., one can’t help but feel sympathetic for this poor kid; -- he just never photographed very well -- period. Poor Kid, even in his later life, he just didn’t photograph very well. [9A]— Note, It is believed that the final Lunacy Commission made an oral as opposed to a written court report, (thus no written records exist), however, we do have newspaper accounts of what was said.